NORTH CANTON, Ohio – In 2008, when surging fuel prices forced airlines to cut service, merge or shut down altogether, many airports took a hit. In fact, nearly 30 U.S. cities saw scheduled service disappear that year, according to the U.S. Bureau of Transportation. Yet Akron-Canton Airport continued to thrive, increasing passengers to 1.838 million in 2012, a banner year, says its president and CEO, Rick McQueen. Still, Southwest Airlines’ acquisition of AirTran Airways, a key carrier for the airport at the time, led to a drop in travelers as Southwest announced route cancellations from Akron-Canton, including flights to New York City, Orlando and Las Vegas, McQueen says. The effects felt by the rest of the industry were substantial. In 2008, an 84.5% year-over-year increase in fuel prices coupled with a weakened economy contributed to an airline industry loss of about $4.3 billion in the first three quarters that year, according to a September 2014 report by the U.S. Government Accountability Office. From the fourth quarter of 2007 to the same time in 2008, some airports reported year-over-year traffic reductions of more than 25%, leading to delays in capital improvements, layoffs and hiring freezes. But while those airports struggled, Akron-Canton invested. It committed to a $110 million improvement plan that comprised 10 projects over the last decade. Dubbed “CAK 2018,” the plan equates to about $145 million, McQueen says, and includes a runway extension that allowed for more nonstop flights, a new entrance road, additional parking, terminal building improvements and a modernized ticket wing. This year, the airport breaks ground on the final piece of the puzzle: replacing gates that date to when the terminal was expanded in 1962. The $32 million project will enlarge the gates to accommodate the aircraft that are bigger than they were in the 1960s. Plans include larger restrooms, more food options and additional amenities that have proven popular, including free business lounges that don’t require membership for use, McQueen says. The project likely won’t be finished by year’s end, he says. It’s not a small undertaking, “but it will position this facility for the future,” he says, particularly among business travelers involved with the oil and gas industry, the Pro Football Hall of Fame and growth of other regional businesses. “It gets us ready for the next step as we move forward,” McQueen says. The number of passengers is increasing as well, and Akron-Canton is on track to serve more than one million this year, McQueen says, even after Southwest ended service in June 2017. The airport is enjoying new success by working to increase the frequency of daily flights with its carriers. On June 8, United Airlines launched the inaugural flight of its daily, nonstop service to Houston. With a water cannon salute June 8, the airport marked United Airline’s inaugural flight to George Bush International Airport in Houston. “This is one of the markets that we’re able to identify that had a large ridership connecting out of our airport on a daily basis,” he says. It’s the eighth daily flight for United from CAK, including five to Chicago and two to Newark. American Airlines added a third daily trip to Chicago, he notes. 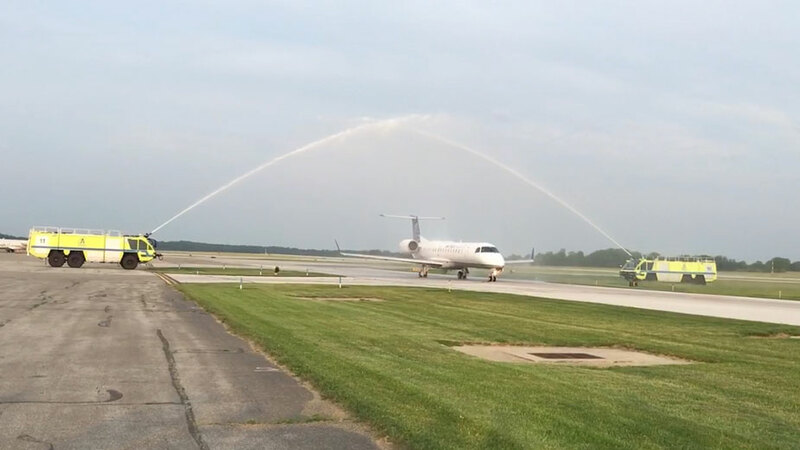 Akron-Canton offers 26 daily, nonstop flights to 12 destinations. As new flights are added, the airport works to shore up community support for the service, he says. Akron-Canton advertises its flights to area tourism bureaus and chambers of commerce to help meet the travel needs of their memberships, he says. And it hosts travel forums for small to medium-sized business. The forums are designed for companies that book their own travel plans and executive assistants who might not be aware of all the options available for business travel. “They’re probably losing out on money, time, perks and benefits,” says the director of marketing at Akron-Canton, Lisa Dalpiaz. Those who attend such forums learn about programs that maximize travel miles and connect with travel management companies that can help them save money, she says. In addition, those who attend can meet and share notes with internal travel management teams for large local companies such as The Goodyear Tire and Rubber Co. and The Timken Co.
“It helps companies travel smarter, easier and for less money and time,” Dalpiaz says. For leisure travelers, Dalpiaz spearheaded the Mom’s Tour in 2017 that acclimated new and expectant mothers to traveling with infants. The idea came to her when she was expecting her first child. Dalpiaz belonged to a few Facebook groups for expectant mothers and says members asked her questions about traveling with a baby. “Our hope is to bring new families in so they can go through the process of parking, going on the shuttle, through the ticket wing, checking in and then TSA [Transportation Security Administration],” Dalpiaz says. During the process, those who attend can speak with an airline station manager and ask questions about its policies, rules and regulations. Speaking with TSA is “the sticking point for a lot of folks,” because they don’t know what they’re allowed to bring on board the aircraft,” she says. Travelers can bring as much food, formula, breast milk and medicine as they deem necessary, she adds. “TSA understands that kids are unique and need what they’re used to,” she says. Response to the Mom’s Tour has been strong. Originally, the airport planned for one tour last year, but that increased to four with more than 80 people taking part. Travelers who couldn’t attend a Mom’s Tour can access a video and travel guide on the airport website at AkronCantonAirport.com/flying-with-kids. In 2017, Airports Council International-North America named the Mom’s Tour its best Customer Service Campaign in a Small Airport. The trade organization serves the U.S. and Canadian air travel industry. “Other airports are reaching out to us to find out more about what we did to set it up so that they can replicate it,” Dalpiaz says. Other features include a private nursing station near the gate and a children’s play area. “We’re doing things like that to try to make it easier for folks,” she says. In January, McQueen announced plans to retire at year-end, punctuating a 36-year career with the airport that’s helped to generate an economic impact of more than a billion dollars. Under McQueen, the airport has contributed to and helped sustain more than 3,000 jobs in northeastern Ohio. And it’s helped to establish the 500-acre Port Green Industrial Park. Operated by the Development Finance Authority of Summit County, the park hosts eight tenants and provides easy access to highway and rail. Pictured: Cutting the ribbon to launch nonstop daily flights to Houston are Frederick Armstrong, United Airlines station manager; Bob Konstand, CAK board member; Rick McQueen, CAK president and CEO; Annette Zappala, United director, regional sales; Chuck Bushley, United sales manager; and Lisa Dalpiaz, CAK director of marketing; Joyce DeMio, CAK corporate relations manager.